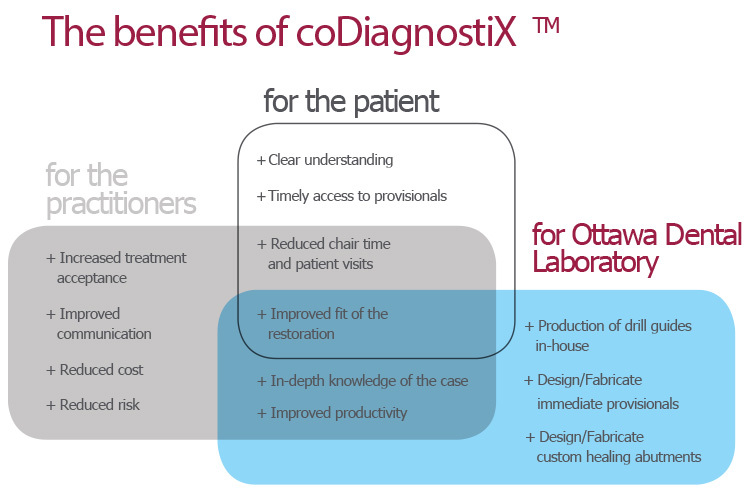 coDiagnostix™, by Dental Wings™, is a dental implant planning software for clinicians and laboratories. With its comprehensive planning features, innovative drill guide design and collaboration tools, it presents an entirely digital workflow that enables the Ottawa Dental Laboratory to deliver predictable results for implant cases. Thanks to an intuitive interface, each type of user can focus on her/his own work. Merge of impression/model scan (STL file) and DICOM data. 3D visualization of the bone morphology and nerve canals for easy identification of the optimal implant position. Fast design of affordable surgical drill guides for safe and predictable results. Fully open library of more than 3,000 implants from about 50 manufacturers. caseXchange™, an online case-sharing platform. coDiagnostiX iPad® app for patient case presentation. DWOS Synergy™, a technology linking coDiagnostiX™ and DWOS™ in real time for integrated implant planning and prosthetic design.